Over the years, Phoenix Sullivan's short stories have been published under her real name in various pro anthologies and magazines. Marion Zimmer Bradley was her first editor. In the corporate world, Phoenix was a professional writer and editor for 23 years. 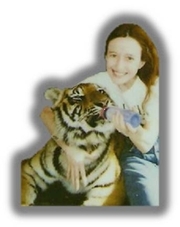 Before that, she was a registered veterinary technician, working with small animal clinics and wildlife rehab centers. Retired now - and still in her early 50s - Phoenix blogs about writing-related matters at http://phoenixsullivan.blogspot.com. Her "Confessions of an Animal Junkie" blog features heartwarming stories about running a farm, being a vet tech and learning to engage with the animals around us. Phoenix Sullivan is a LibraryThing Author, an author who lists their personal library on LibraryThing. Phoenix Sullivan's book SECTOR C was available from LibraryThing Member Giveaway. Phoenix Sullivan is currently considered a "single author." If one or more works are by a distinct, homonymous authors, go ahead and split the author. Phoenix Sullivan is composed of 2 names. You can examine and separate out names.